A growing number of Americans are opposed to providing government assistance to ailing financial institutions, according to a new CBS News poll. 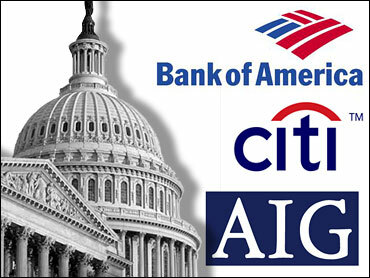 The poll also shows that the public clearly blames the management of the banks for the crisis and that many Americans are feel resentful that irresponsible banking executives could benefit from the hundreds of billions that has been doled out to banks and other financial institutions in the last six months. In the poll, conducted by random sample from March 12 to 15, only thirty-seven percent of Americans approve of the government giving money to banks and financial institutions as a way of trying to fix the nation's economy. Fifty-three percent disapprove - the highest number since CBS News starting asking about bailouts to financial institutions in December. At that time, forty-six percent approved and forty-four percent disapproved. The disapproval number has risen steadily in polls conducted since then. As for where to put the blame, Americans are pointing the finger for the nation's banking problems on the institutions themselves. Three in four Americans say the banks' and financial institutions' problems are the results of their own management decisions, while only seventeen percent say they are mostly the result of economic conditions outside the companies' control. In addition, it appears bonus payments, such as those made to AIG executives recently, are also having an impact about the public's feelings and perceptions of how the bailout money is being spent. Nearly half - 48 percent - of Americans say they are now mostly resentful that President Obama's policies toward the nation's banks and financial institutions could benefit irresponsible managers and bankers. But 40 percent say they are relieved that aid to banks might cause them to start lending again. Along with some public resentment, 48 percent of Americans think the economy would improve without the government providing money to these companies; while 41 percent think the government aid is necessary to get the economy out of recession. Even a fifth of those who disapprove of the bailout see it as necessary. On another note about the economy in today's poll, concern about unemployment has dropped since last month. Now, 30 percent of Americans say they are very concerned that someone in their household might lose their job sometime in the next twelve months - down from a high of 44 percent at the beginning of February. Still, another 30 percent say they are somewhat concerned. Thirty nine percent now say they are not at all concerned. This poll was conducted among a random sample of 896 adults nationwide, interviewed by telephone March 12-15, 2009. Phone numbers were dialed from RDD samples of both standard land-lines and cell phones. The error due to sampling for results based on the entire sample could be plus or minus three percentage points. The error for subgroups is higher.